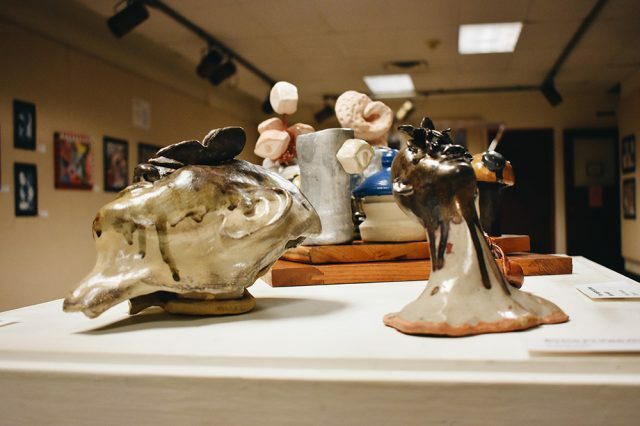 The collection of artwork displays the contributions of over 30 artists from the student body at large. With so many different pieces and contributing artists, the exhibition presents an impressive diversity of approaches to the given theme. The description of the exhibition says it is a “visual exploration of the ideas of society, relationships, belonging and not belonging, and negotiating differences.” To the contributing art students, this translates into artwork addressing such topics as foreign policy, the environment, social media, childhood and development, culture, mental health, power and difference. Anonymous quotes from students dot the walls, providing clues to the messages contained in the artwork. “Society itself tips one way or another, changed by the traditions made in the past,” says one such quote. “The growth and beauty of the natural world is an important part of peace work,” says another. One of the pieces, by senior Bridgette Webb, is bright acrylic painting on canvas depicting a honey bee and a blossom made out of metal. The piece is titled “A Bee in a Metal World” and speaks to the global pollinator crisis that is largely absent from everyday conversations. Webb’s piece challenges viewers to consider honeybees and other pollinators as the “other” to our human society. Meghna Das, a second-year majoring in Visual Arts and Secondary Education, is another student with featured artwork. Das was one of four art students who presented their art in the convocation on Jan. 9 that focused on the arts showcase. Dianna Campos, Rachel Yoder and Andrew Nussbaum also presented artwork during the convocation. Fifty Shades of Elephant is an acrylic painting by Das that depicts an elephant decorated with vibrant colors, cloth and jewelry. “I knew that I wanted color to play a key role in my piece because color is very important in all the traditions and festivals back home,” Das said. For Das, home is India. This is one of her primary sources of creative energy. “I am really big on bringing aspects from my childhood or my life in India into my pieces … I am in my comfort zone when it comes to creating work that represents what has helped me be the person I am today,” Das said. This exhibition will run in the Good Library Art Gallery until Feb. 20.